Chenoa Farnsworth attends 10 to 15 business and tech conferences across the U.S. and Asia each year. She knows the good from the bad. That’s why in 2014, when the managing partner of Blue Startups joined with co-founders Maya Rogers and Henk Rogers to launch their own event, she had a few ideas on how things should go: Attendees should be able to interact with speakers, sessions should be short but impactful and you shouldn’t spend the entire conference in a ballroom. Where innovation is coming from. “The agenda captivates a lot of people from a variety of industries and positions,” says Justen Burdette, the CEO of Mobi. Burdette, who is based in San Francisco but travels to Hawaii one or two times a month, attended East Meets West for the first time last year. Burdette says the event is relevant whether your business is new or established. “Mobi launched in 2005, so we’re by no means a startup, but in the last year we’re trying to reinvent the company,” he says, adding that he’s trying to infuse the startup innovation mentality within Mobi’s company culture. The local wireless provider is such a strong supporter of Hawaii’s startup community, says Burdette, that Mobi is a platinum sponsor for the 2019 conference. East Meets West includes a tour of local startup accelerators, such as Blue Startups. About 30 people present at East Meets West, including a mix of standout local entrepreneurs, high-caliber investors and tech titans. This year’s speakers include Rotten Tomatoes co-founder Patrick Lee; Hans Tung, a managing partner at Silicon Valley-based GGV Capital (he has been ranked by Forbes Midas List as one of the world’s top venture capitalists); and Meli James, a co-founder of Mana Up, a Hawaii-based initiative designed to build the state’s next generation of CEOs in the retail and food product industries. Another bonus for attendees, she adds, is the first day is spent at places across Oahu and includes outdoor activities. “I hate the idea of spending the whole time in a hotel ballroom when you’re here in paradise!” Day One of East Meets West features a downtown Honolulu tour of Blue Startups and other accelerators, one-on-one meetings, lunch with fellow participants and speakers, and optional activities such as hiking, stand-up paddling and learning how to pound poi. Henk Rogers is a co-founder of East Meets West. “Part of why we’re doing this is to open people’s eyes and open their mind about what Hawaii can offer. I think everyone understands what Hawaii can offer the tourists, but they don’t really understand what Hawaii can offer the businessperson,” Farnsworth says. Day Two is more of a traditional conference and this year takes place at the Sheraton Waikiki. Attendees will listen to keynote speakers and join 30-minute breakout sessions. 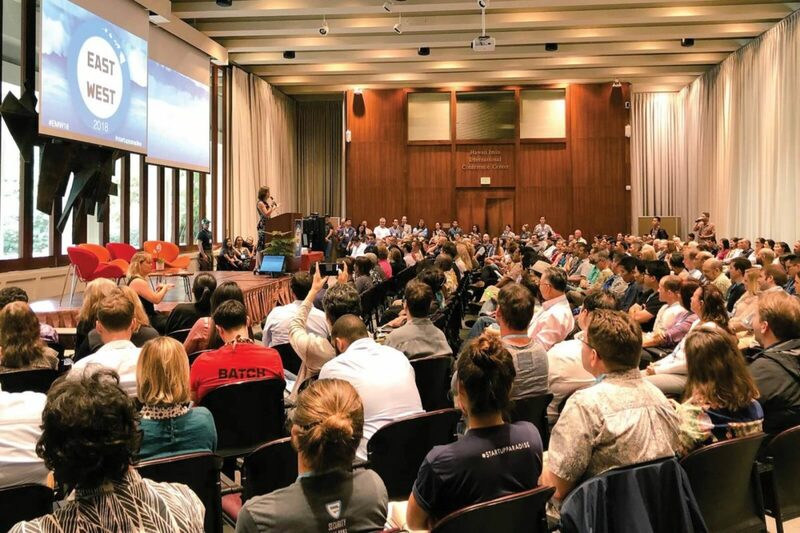 Because this is put on by Blue Startups, the event also includes a startup pitch session, in which 10 companies – five from the U.S. and five from Asia – compete for funding. “We use the event as a way of vetting potential applicants for the next cohort (at Blue Startups). It’s a great way for us to get to know them and understand their business,” Farnsworth says. New this year is the Hawaii showcase, an exhibition of 10 to 15 Hawaii-based companies. The conference will also include an entrepreneur boot camp, which includes actionable advice on search engine optimization, fundraising and other topics. Tickets: $245 – Use the promo code “HawaiiBusiness” for 30% off!